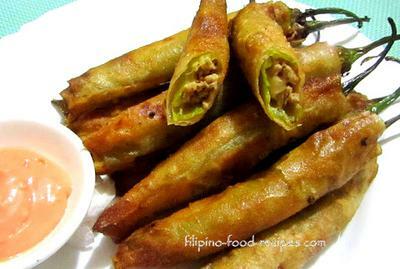 ...anything that can be wrapped in a spring roll wrapper and fried or served as it is -- that's a Lumpia! Savory fillings are always served with either a sauce or a dip - sweet and sour duck sauce, vinegar dip with chili, or sweet sauce with peanut and fresh garlic. It is important to know that when working with spring rolls, you need to cover them with a damp towel to keep them pliable. They usually come frozen when you buy them from the Asian market, so thaw only what you need, use a sealed plastic for the excess and put them back in the freezer. Also, traditionally, do not use the Spring Roll Rice Paper kind, they're usually for Vietnamese spring rolls. 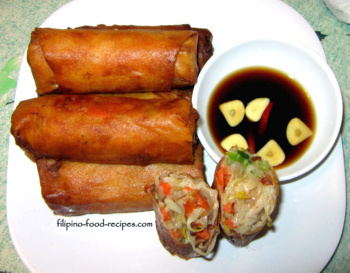 But if you want to experiment, use it for the fresh lumpia recipe - just follow the package instruction. Fresh Vegetable Lumpia with Green Beans, Carrots and Sweet Potatoes. Sauteed Vegetables(Sans Spring Roll Wrapper). Fresh Vegetable Roll with Heart of Palm Filling. Fried Eggroll with Cheese Filling.